This extandble monopod mount allows you to capture footage with a POV style anywhere you go. 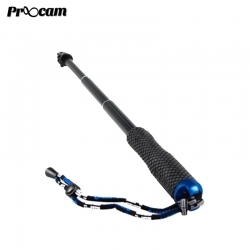 It extends from 18cm to 49cm with a lock feature so you can lock the monopod at any length. The monopod is great for all kinds of activities including swimming, skateboard etc. and is compact enough to slide in your pocket or bag. Built-in Adapter to Attach to All GoPro SJCAM Cameras. Twist Lock at Any Length. Extends from 18cm to 49cm.